The Organisation for Economic Co-operation and Development has revised its economic forecast for the Eurozone and the UK. In both areas, the OECD is predicting negative growth in Q4 of 2011 and Q1 of 2012. Two consecutive quarters of negative GDP growth meets the technical definition of a recession. 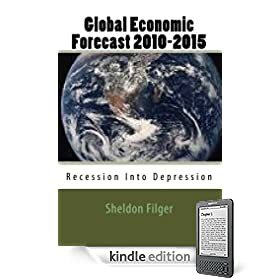 Other economists believe that the Eurozone, United Kingdom and the United States have already entered a double-dip recession. As the global economic crisis worsens, the debt crisis metastasizes and more and more sovereigns are having their public debt downgraded by the ratings agencies, the equity markets are soaring again. Why is that happening, when global economic and financial fundamentals are so rotten? It appears that a false rumour that the IMF was going to bailout Italy from its suffocating public debt was the catalyst for the stock markets to rally strongly. Even when the report was officially denied, the equities maintained their climb. It must be that equities reside in a parallel universe, devoid from the inconvenience of fiscal, financial and economic reality. The debt crisis contagion in the Eurozone continues to metastasize. With Italy’s ten year government bonds above the red line of 7 percent yields despite a new government, Spain is now approaching that same zone of danger. Spanish government bonds with ten year maturities are very near the toxic level of 7 percent. With the two largest PIIGS nations in the Eurozone on the verge of insolvency, it is quite clear that the attempts to a avoid a contagion from the Greek debt crisis have been a monumental failure. The politicians in Europe are so desperate that they have actually ditched democracy in a last ditch effort to avert a catastrophic implosion of the Eurozone. Appointing unelected governments and forbidding popular votes on economic and fiscal policy , not to mention eroding national sovereignty are the last refuge of the bumbling European politicians. The latest developments in the Spanish debt crisis show that these desperate measures are likely to be as dysfunctional as all other previous efforts to forestall an inevitable disaster from occurring. Not long after my last post warned how near Italy was to passing the 7 percent yield on its ten year government bonds, the dire red line has been passed. It should be pointed out that the crisis in Italy is not only based on market reaction to its horrid politics; the Italian economy is coming apart at the seams, with business bankruptcies proliferating amidst a demographic contraction that makes future economic growth in a time of austerity highly implausible. Now that Italian bonds with ten year maturities are above 7 percent in yields, the Eurozone is reeling and global markets are swooning, after experiencing a maddening series of rallies based entirely on false hopes predicated on statements from hopelessly inept politicians. Now, except for the most gullible, the consensus among economists who even previously expressed optimism about a global economic recovery is that the Eurozone is likely headed to some form of break-up. If Americans are laughing at their comrades across the Atlantic, they shouldn’t be. The economic and fiscal tragedy unwinding in Europe is a harbinger of what soon lies in wait for the United States, which has the mother of all fiscal imbalances. The Eurozone’s latest Greek debt bailout plan, following previous Greek, as well as Portuguese and Irish bailouts, was supposed to ring-fence the largest PIIGS nations; Spain and Italy. The Spanish economy is highly vulnerable to a raging economic recession and massive unemployment. However, it is Italy, with a two trillion euro public debt and stagnant economic growth, that is now the greatest danger to the Eurozone. The supposed ring-fencing of Italy that was the prime motivation for the Greek debt write-off and bailout is clearly a failure. Only days after the latest Eurozone debt crisis plan, spreads on Italian government bonds are soaring. The latest yield on ten year bonds issued by Italy is now in excess of 6.6 percent. Should these yields pass seven percent, it becomes mathematically impossible for Rome to finance its deficits and debt repayments. That would mean that the Italian government would require being bailed out. The problem, however, is that there is not enough resources available in the Eurozone to bail out Italy. The only hope left, and it is a feeble one at best, is that Italian Prime Minister Silvio Berlusconi will resign, and thereby restore some level of market confidence. However, the problems with Italy’s finances go beyond one single bumbling politician. The issues are structural, not personality-based, and so far no real viable solutions have emerged. A full-fledged Italian sovereign debt crisis will probably be the kiss of death to the Eurozone, at least in its present form. French President Sarkozy and German Chancellor Merkel had barely popped open the champagne bottles when their supposedly final, permanent fix to the Greek debt crisis got thrown for an unexpected loop. There is a word of Greek origin called “democracy” which has been totally lacking in all the machinations of the policymakers and their financial lobbying friends since the eruption of the global economic crisis. Now, in a surprise move, Greek Prime Minister George Papandreou announced plans for a popular referendum on the latest Eurozone bailout package. Knowing that the public of Greece is overwhelmingly opposed to the bailout crafted in Brussels, the European politicians and the markets castigated the Greek prime minister. This morning, the consensus was that Papandreou would certainly resign and cancel the referendum. Based on these reports from supposedly reliable sources, the stock markets launched a major rally. When Papandreou addressed the Greek parliament, however, he did not offer his resignation. He also did not cancel the referendum. Instead, he invited opposition New Democracy leader Antonis Samaras to join him in a national consensus supporting the Eurozone bailout package, with the carrot being that if this occurs, he would then find the referendum unnecessary. Samaras has responded by calling on Papandreou to resign, and for new Greek elections to be held within 6 weeks. Instead of resolving the Greek debt crisis, the latest effort from the clowns in Brussels has sparked more political instability in Greece, while in the meantime the other PIIGS insolvent Eurozone members, in particular Italy, are headed for their own debt catastrophes, unhindered by the supposed definitive solution to the sovereign debt crisis in Europe that is now up in the air.